The Lower Modernisms – 003. 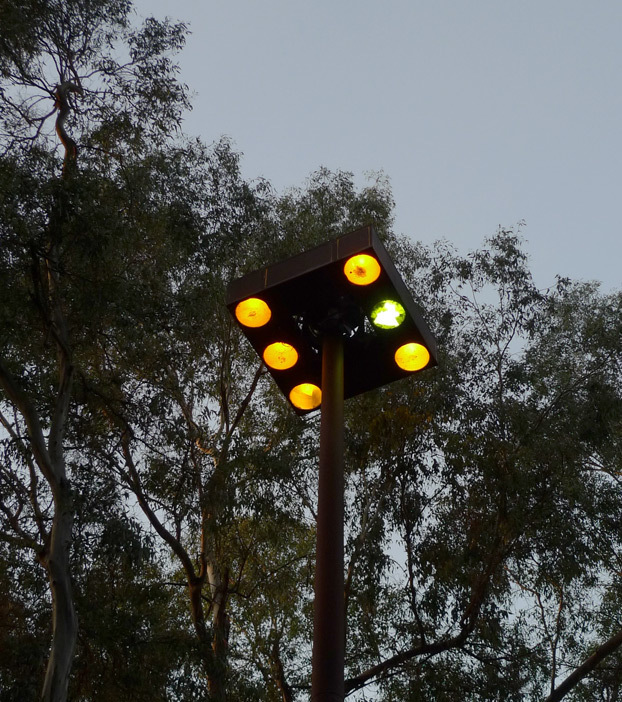 Lomo Featured Project: The Washroom Pavilion at Huntington Beach Central Park. Lomo Building Types: Washroom Buildings. The gemlike perfection (architecturally speaking) embodied in this little washroom pavilion in the Huntington Beach Central Park comes as a surprise to me, although this perfection might well be overlooked by its users. 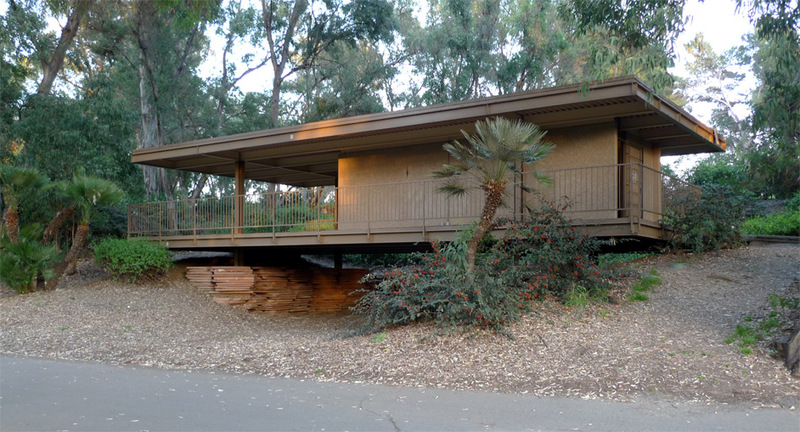 It is a gratuitously rigorous and refined work of high-modernist architecture, despite its humble program. The expression and detailing strongly convey the influence of Ludwig Mies van der Rohe. Upon first look, one reads the horizontal planes of the floor and roof, neatly balanced one to the other. The pavilion is supported by only four slender columns, each receding from the corners of this building to create a double cantilever at the corner, reinforcing the horizontality of the roof and floor planes. Despite all the flat land available in the park, the building has been sited above a little ravine, or perhaps the ravine been cut beneath the building on purpose, deep enough to allow one to pass beneath it. The intended effect is that of the building floating above the landscape, as well as that of reinforcing the similarity between the roof plane and the floor plane. Informally stacked flagstones shore the earth, the stack deliberately stopped short of reaching the floor, harmonizing in color with the building above and recalling the topographic models of cut cardboard almost certainly used by the architect during the design process. The earth seems just barely to reach up to meet the floor at each side of the pavilion. The immediate area feels as if protected by a cordon of trees framing it on three sides, while the approach from the path is sparsely but elegantly landscaped with smaller palms and shrubs. The walls of the pavilion that partially enclose the men’s and women’s rooms are pulled free from the columns, an expression of the distinction between structure and enclosure. There is no load-bearing structure found within the enclosing walls. Now retrofitted with swing gates, originally no doors were necessary – the rooms are delineated by a free arrangement of vertical walls that define space without cutting it off completely, much like the Barcelona Pavilion of Mies van der Rohe. The cruciform columns more literally take their inspiration from Mies, echoing the profile of those at Mies’s Neue Nationalgalerie in Berlin; here they were probably created by splitting a wide-flange column and welding the two halves to the web of another wide-flange column. The symmetrical shape of the columns relates clearly and logically to the wide-flange beams that support the roof. Column and roof beam are painted different colors, to differentiate the vertical structure from the roof plane, and to reinforce the unity of roof beam and corrugated metal deck. 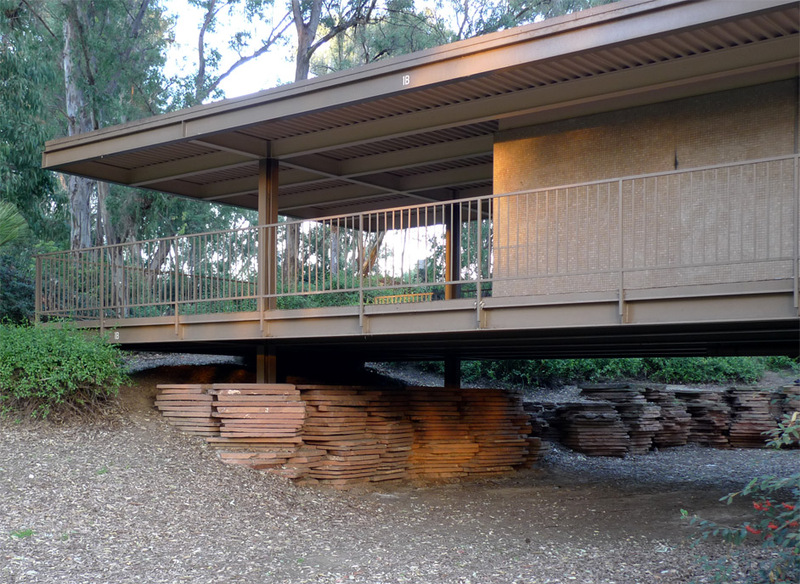 The thin floor slab – detailed so that when viewed from below or outside, one does not read beams as being underslung from a floor, but rather as a single horizontal plane – has a simple grid of concrete squares atop. The grid relates to both the structure and the walls, and appears to have been used for planning purposes by the architects in the design of the pavilion. The washroom pavilion clearly dates from the 1960s or 1970s, the latter period of high mid-century Modernism. By this time, so much had been figured out, approaches to detailing and expression perfected and ethical conundrums comfortably settled, that it must have been a fairly straightforward process to design a taut and elegant building like the pavilion. I have not performed any research to figure out what architects were involved, but it is possible that this was the work of the Neutra office, considering that the masterful Central Library, completed by Dion Neutra in 1975 after the death of Richard Neutra in 1970, is right up the hill in this same park; but the washroom does not share any identifying characteristics with the library that would confirm this speculation. Despite its excellence, this washroom pavilion would not be found in any histories of modern architecture. Its designer is a mystery, and few architecture students will be making a pilgrimage here just to experience the interplay of light and shadow or experiment with its facilities. The pavilion is an example of a building excluded from the canon by its lowly building type, or “program,” to use the professional terminology. A free-standing washroom of approximately 250 square feet would generally not be considered a sufficiently weighty program to have the potential to rise to the level of Architecture. The Huntington Beach Central Park Washroom Pavilion is one of the finest of a building type we know from public spaces such as municipal parks, beaches, and national parks. We also encounter this typology by the side of the freeway at rest stops. All of these have a bit of a sleazy reputation. We might be scared to approach at night, when they take on the sinister aspect of a horror movie. Rest stops have acquired a reputation as spots where men cruise for anonymous sexual encounters. The HBCP pavilion featured a tactful sign (sorry, not pictured) advising users that undercover officers regularly patrol the park, without alluding to why there would be any need for patrolling. In the case of this washroom pavilion, paradoxically, the lowbrow program presents a real opportunity for the designer to produce a Modernist building of great rigor and integrity. A small building like this has a relatively small cost, and therefore the cost premium for doing quality work is smaller in absolute terms. 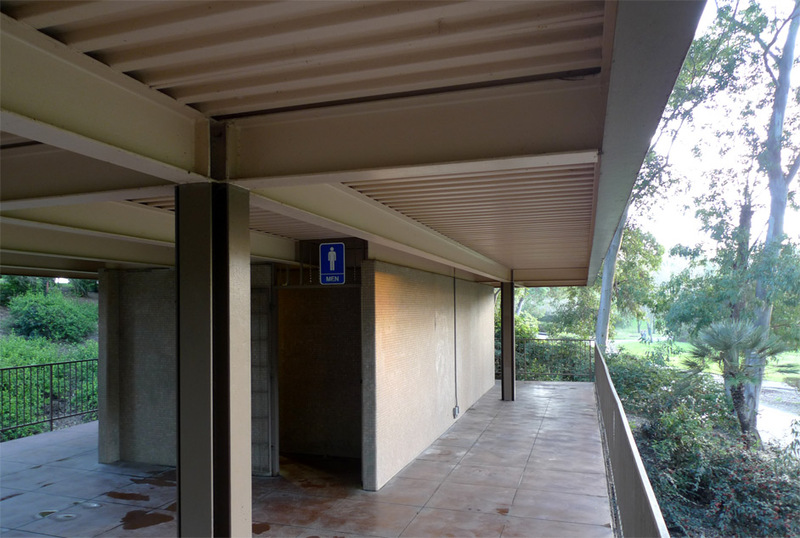 A washroom building in Southern California does not need to be fully separated from the environment, which means no insulation is required, and waterproofing and roofing systems greatly simplified; if it leaks somewhere, little pain would be caused. Not only is the cost of these systems saved, but more importantly, largely eliminated is the architect’s great challenge of designing details such as roof edges, watertight material transitions, and expansion control joints to be not only functional, but also elegant and refined. As is often the case in Lower Modernist buildings, the handicaps that appear to limit a building’s potential turn out to be precisely what makes a building exemplary. As one last treat, following is an image of the geometrically pure lamppost head across from the washroom pavilion. I’ve been to that sweet washroom. And sadly it’s probably better than any house I could ever afford to build. Great observations, James. This makes me want to go (visit). Just googled “Mies roof” and saw this picture in the image search results, lo and behold architecture burger making connections. Nice write up.